It’s not everyday that you get to spend an evening with a #1 New York Times best-selling author. 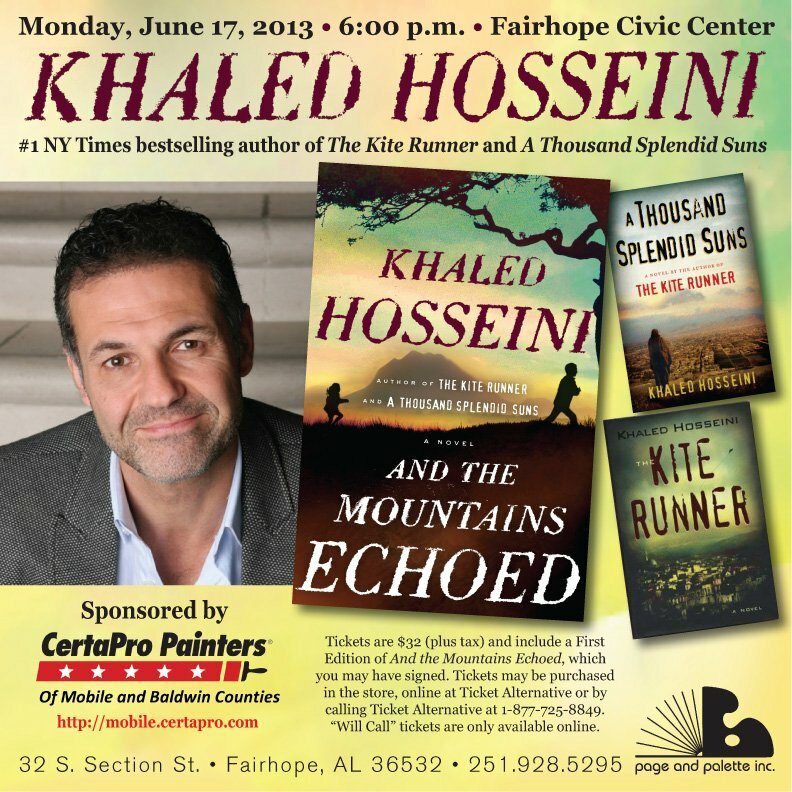 Page & Palette is thrilled to present #1 New York Times bestselling author of The Kite Runner and A Thousand Splendid Suns, Khaled Hosseini and his latest novel And The Mountains Echoed, Monday, June 17th, 6PM, at the Fairhope Civic Center in Fairhope, Alabama. And The Mountains Echoed is a new novel about how we love, how we take care of one another, and how the choices we make resonate through generations. In this tale revolving around not just parents and children but brothers and sisters, cousins and caretakers, Hosseini explores the many ways in which families nurture, wound, betray, honor, and sacrifice for one another; and how often we are surprised by the actions of those closest to us, at the times that matter most. Following its characters and the ramifications of their lives and choices and loves around the globe—from Kabul to Paris to San Francisco to the Greek island of Tinos—the story expands gradually outward, becoming more emotionally complex and powerful with each turning page. Khaled Hosseini will spend the evening discussing his new novel, earlier works, and his history. *Tickets are $32 (plus tax) and include a First Edition of And the Mountains Echoed, which you may have signed. *Customers who have a copy of And The Mountains Echoed (purchased from Page & Palette or through Ticket Alternative) will be allowed in the autographing line. Mr. Hosseini will sign as many copies of And The Mountains Echoed as a customer would like to purchase. *Mr. Hosseini will also sign backlist copies of The Kite Runner and/or A Thousand Splendid Suns with the purchase of at least one copy of And The Mountains Echoed. Mr. Hosseini will only be able to sign the above titles, i.e. no paraphernalia, photos, posters, etc. *Mr. Hosseini will also personalize books. *Page and Palette will have a staff member available to assist customers in taking pictures while waiting in the autograph line. To keep the line moving smoothly, there will not be time for posed pictures with the author. Grab your tickets here and join us for an evening of inspiration!